VLESP is located on the campus of UZ Gent, on the first floor of the building named K12F. From the city centre, you can reach the VLESP via the R4 and the main roads De Pintelaan and Zwijnaardsesteenweg. Via the R4: From both the east and west, you can easily reach the campus via the R4. Via the highways E40 and E17: the E40 (Ostend - Brussels) connects via the 'Zwijnaarde' interchange with the E17 (Antwerp - Kortrijk). On the E17, there is a separate exit No. 9 'Universitair Ziekenhuis' or 'UZG'. Note that the entrance of the UZ Gent is situated at the Corneel Heymanslaan and no longer at the De Pintelaan. Sint-Pieters Railway Station is a 20 to 25 minute walk from the VLESP. From the suburbs and the city centre, there are buses and trams to the UZ Gent. You can calculate your route using the website of De Lijn. 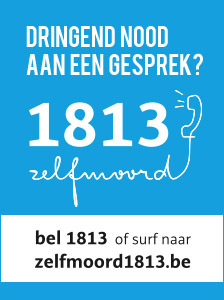 Call 1813 for the suicide helpline, or visit Zelfmoord 1813 to chat or e-mail (only in Dutch).